There are many commercially available hearing technologies that help people with hearing loss live rewarding and productive lives. 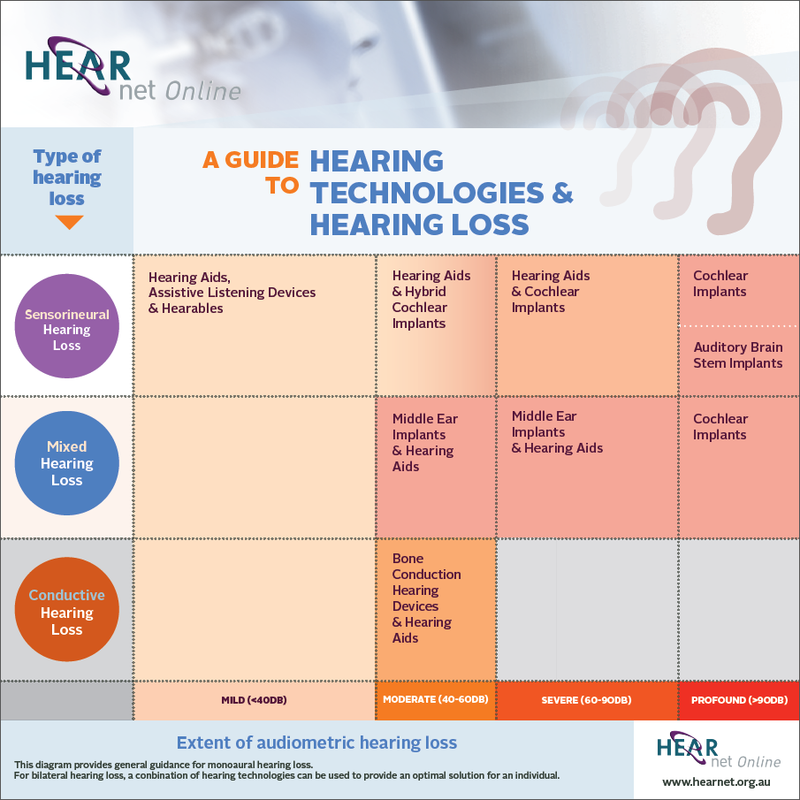 The infographic below provides a general guide to what these hearing technologies are with links to informative HEARnet Online webpages to help you work out which technologies may be suitable for you or your families’ hearing needs. Click on the types of hearing technologies to find out more. HEARnet Online also has the Interactive Ear – an interactive animation that provides a visual way to quickly understand hearing loss and how different hearing technologies can be effective in managing certain types of hearing loss. It is important to remember while using this guide that the extent of an individual’s hearing loss varies depending on the pitch (frequency) of the sounds they can not hear. HEARnet Online recommends seeing a hearing health professional, such as an audiologist, to have a hearing test to determine the type and extent of your hearing loss across all sound frequencies. Please note that further investigation into the suitability and eligibility to access any of the technologies described by HEARnet Online should be done in consultation with a qualified audiologist. HEARnet Online has specific webpages listed below that explain hearing technologies in more detail, including how they work and can be used with different types of hearing loss.